When the Eagles hit the practice field today, there was a new face among them. 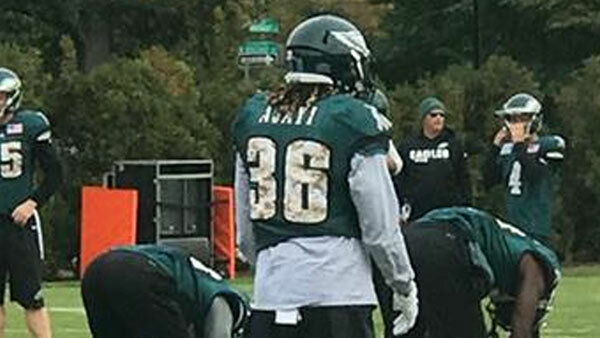 Running Back Jay Ajayi, who was acquired yesterday at the trade deadline from Miami in exchange for a 4th round pick, was out there wearing number 36, which everyone will forever associate with another Eagles running back, Brian Westbrook. If Ajayi can put up numbers anywhere close to BWests, Eagles fans will be thrilled. Many of the questions to Doug Pederson this morning were about Ajayi, mostly how he'll fit amongst an already crowded group of backs, led by LaGarrette Blount. Pederson claims Blount's role "will not change." GM Howie Roseman reportedly talked with Blount after making the deal. There are many reports out of Miami that suggest Ajayi was traded in part because of a bad attitude along with mental mistakes. Clearly the Eagles, at 7-1, have quite a unique chemistry amongst the players in the locker room, the fear being that Ajayi will disrupt this in some way. Pederson said he trusts in the veterans to acclimate him. "We've established a culture on how we do things around here. I implore those guys to just embrace it and to bring him in." I asked Carson Wentz if he's worried about shaking things up and he told me not at all. He added that if anything ever were to be an issue, the core group of leaders would make sure "it'll get squished." Wentz thinks Ajayi will be a "great fit." Pederson called him a tough, powerful runner with great field vision. He wouldn't commit to playing him this Sunday against the Broncos quite yet, because he wants to give him time to learn the system.